I was told that this was going to be one of the most epic parts of our Pixar Animation Studios tour. To the naked eye, The Pixar Living Archives is just an average, almost boring building. But if those walls could talk, you would find one of the most treasured collections of Pixar history. 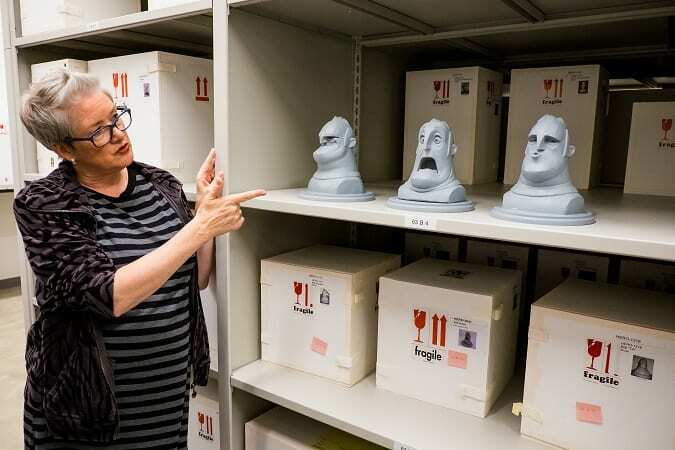 Not many have been invited inside the Pixar Living Archives, but we soon learned why this building played a key role in the making of Incredibles 2. 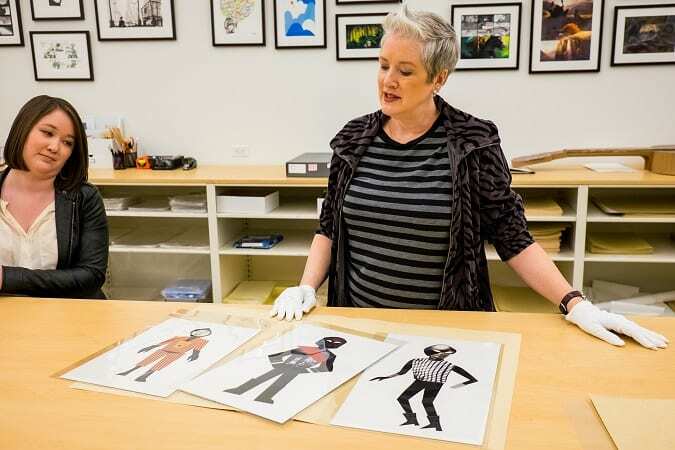 Come inside for a rare behind-the-scenes look of Pixar – and see an alternate version of Edna Mode that would make your head spin. 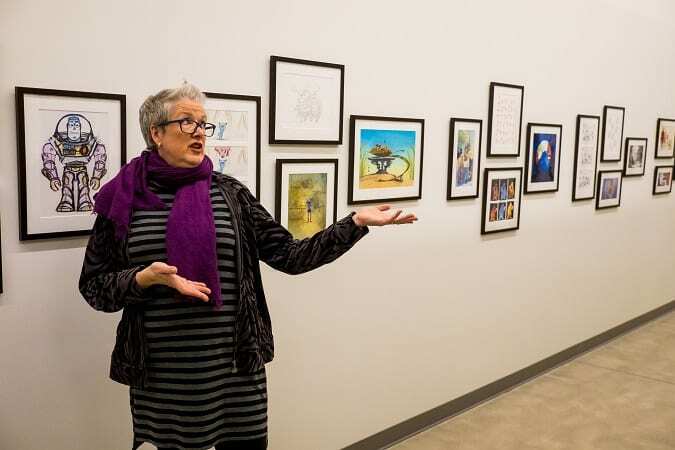 The Pixar Living Archives building is lovingly called “Queens” (since all of the buildings have an New York City theme) and is located in a super secret spot near Pixar Animation Studios. Originally a warehouse, this dry fire suppressed and special climate controlled space preserves the history and very essence of Pixar Animation Studios including original pieces from the art departments, story departments, every version of every script and a special historical section for Pixar itself (like the 1986 founding of Pixar press clippings). Newly moved in May of 2016, the archivists are still getting used to the layout of the land. Everything is pristine, organized and surrounded by shelves, shelves and more shelves – all in Pixar movie order, of course. Greeted by lead archivist and Pixar historian Christine Freeman, we were in for the Disney tour of our lives. Inside one of the rooms of shelves were endless amount of large boxes, each containing a Pixar sculpture. As Christine Freeman opened a box labeled “Sid,” you could hear the crowd of gasps that followed. Toy Story was a breakthrough movie on so many levels, and these sculptures helped to shape (get the pun?) the earliest creations of the iconic Pixar animation. Each fimo clay sculpture had hand drawn lines across them, in which a digitizing wand was waved and transferred from concrete sculpture to 3D formed mesh computer animation. In non-animator speak, these sculptures were used as proof of concept of 2D drawing design to 3D computer animation. So cool. Since we were there for the Incredibles, we got to look at a different set of sculptures. These Incredibles Bond Expression Heads were posed in the most extreme facial expressions to help the character portrayal throughout the film. We also saw full sized sculpts of Violet and Frozone before moving on in our tour. You know that it’s serious when the white gloves come out. Our last stop in the Pixar Living Archives was a large room with a huge counter table for original artwork to be analyzed, preserved and possibly studied for future films. So this is the counter where The Incredibles artwork was brought back out to be studied for Incredibles 2. The art team came to the archives and were so inspired by the work they saw – they immediately went back to their offices to draw. We got to view just some of the amazing samplings of art they viewed. These are the original artwork drawings model packet for Frozone. Also called “the artistic conversation,” this packet contained the details of Frozone from every possible angle. They were used and referenced by artists, sculptors and animators to ultimately produce the finished look. Chills (yes, pun intended). Lou Romano, the production designer of The Incredibles, made 8 original paintings of the colour script on gouache before he decided to do the rest of the colour script on Photoshop. These individual pieces of art were just breathtaking in person. This picture just doesn’t do them justice. We got to see lots of amazing concept art of potential Edna E. Mode looks including a flipped hairdo and even odder wardrobe choices. But this picture blew me away. How about this possible Edna artwork? Could you imagine her as a mad scientist? Nope, me neither. Obviously, this rare look inside Pixar Living Archives is only the tip of the iceberg of treasures that lie within these walls. I love that I got to sneak in one last question before we left. So what would be the most valued piece of Pixar history stored here? 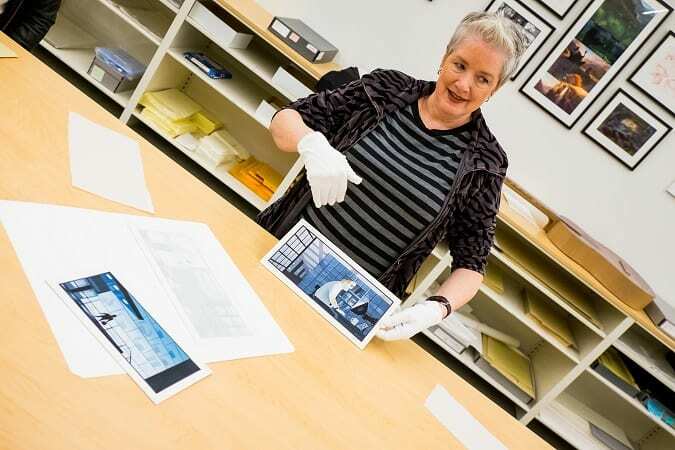 If the building were burning, what would lead archivist Christine Freeman take with her? Ralph Eggleston’s original colour scripts of Toy Story. No question. 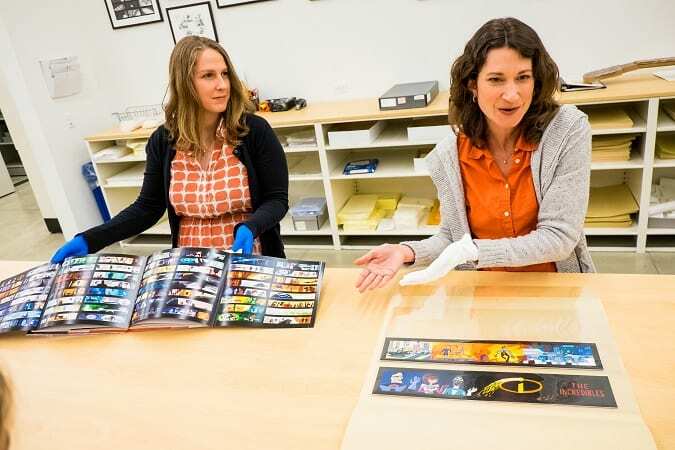 Did our visit to the Pixar Living Archives inspire you? Yup, me too. 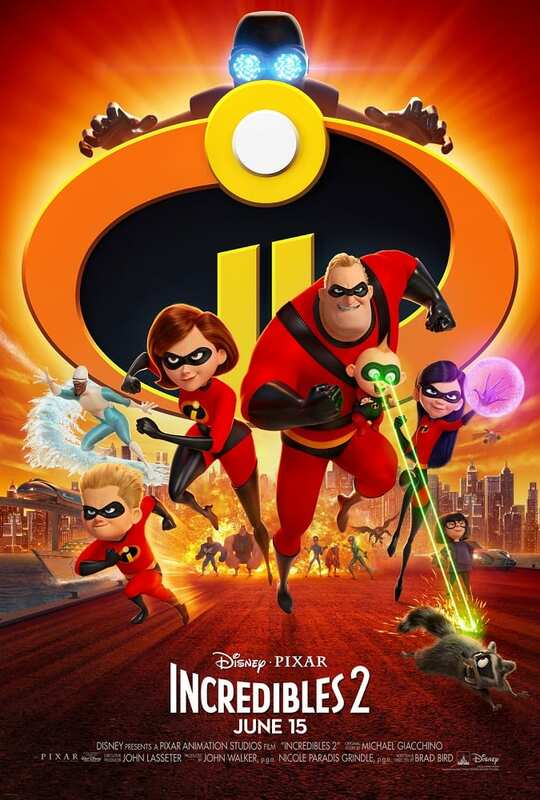 I have a new appreciation of the art of The Incredibles and how years of Pixar history helped to shape Incredibles 2. Check out the newest trailer and be inspired. 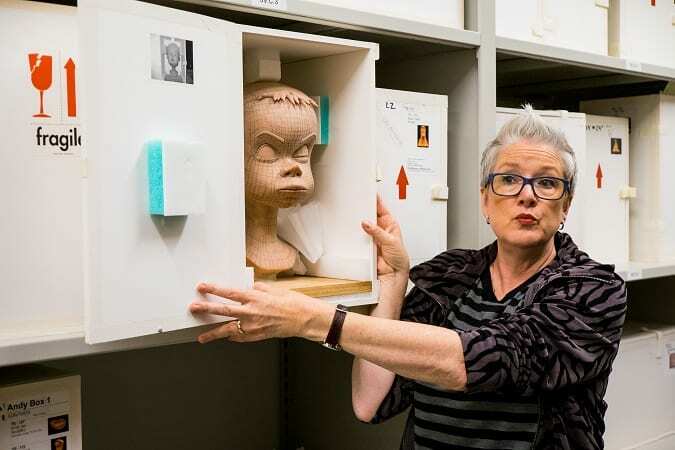 Is visiting Pixar Living Archives on your Disney bucket list? 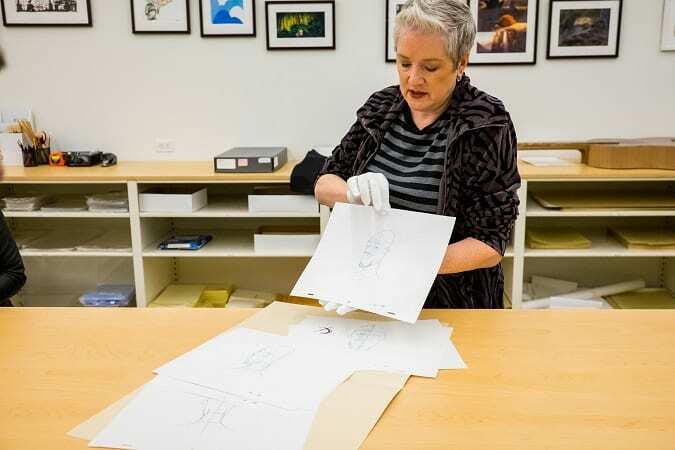 What’s the coolest thing about the Pixar Archives? 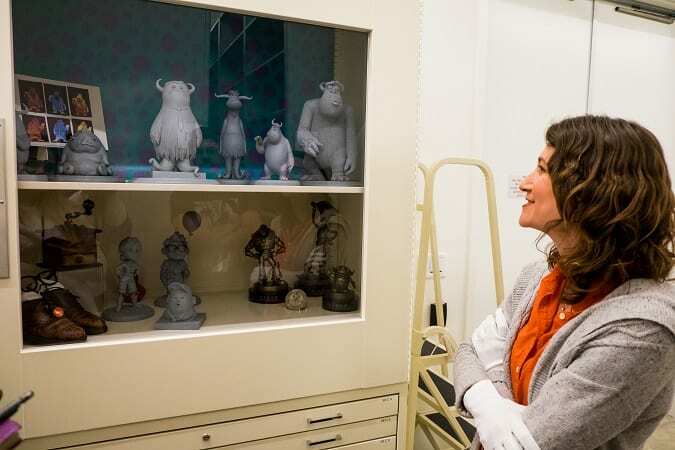 This is a very cool tour of the pixar archives.